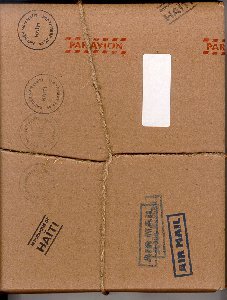 The four vignettes of Kat Rèv Nan Haïti are drawn from a book-length manuscript in progress, Soul in a Bottle, about my travels in Haiti from 1995 to the present. This work grew out of magazine assignments I had sought to help pay expenses for my first trips; however, I was unable to produce anything that was suitable for publication in commercial magazines. In fact, the more I became able to satisfy myself with this writing the less satisfactory it became from the point of view of the glossies. More and more it seemed an end in itself simply to write this material and I stopped thinking about publishing it at all. Some parts of the manuscript have appeared in literary quarterlies, but the vignettes in Kat Rev have not appeared anywhere else. The four of them were selected by Widgets & Stone Press editor and designer Paul Rustand from a longer chapter of the work called "Ba'm Dlo" ("Give Me Water"); no other portions of this chapter have been published elsewhere.